And fish. Lots and lots of fish. Not for nothing is the delicious Algarvian diet so focused on things piscatorial. To its south and west, this small region is edged by an Atlantic Ocean teeming with fish and seafood. Most are commercially caught, of course – but there’s nothing to stop you having a go, while holidaying at Rocha Brava. There are over 200 species of fish in the seas surrounding the Algarve. This includes 300kg marlin – which can be caught for sport, but must be returned. Marlin aside, you can fish for (deep breath): tuna, conger eel, sea bass, white hake, mullet, snapper, sardines, mackerel, sole, scabbard fish (a Madeiran speciality), sea trout, barbell, carp, sturgeon, and even sharks such as the hammerhead, blue and mako. What you catch will depend how and where you choose to fish (on or offshore; bottom or fly; and so on) but below are some options. If you really want to make an occasion of it, you’ll probably want to charter a boat and head a (little) way off into the open ocean - like the folks pictured above. Heading 29kms east from Rocha Brava along the EM1154, N125, A22 and N35 will bring you to Albufeira. As with any seaside town around these parts, there are numerous companies operating fishing trips from Albufeira, including Cascais Fishing, whose boat you can charter for an eye-watering £1,157 per day. Mind you, that’s for up to 10 people, and is proper game fishing. But if you’re looking to have fun and land a more modest catch, why not hook up with Wish and Fish for a reef-fishing outing? They’ll take you on a three-hour boat trip from the Marina – a great way to experience fishing in the deep seas. The professional and experienced crew is at your disposal and will teach you everything you need to know, regardless of age or experience. You can expect to catch mackerel, grouper and snapper. Their website is a bit coy as to prices, but looking at the market ‘in the round’ I think you can reckon on €40 per person as a starting point. Further east along the coast you’ll find Vilamoura, 40kms along the EM1154 and N25. Vilamoura is home to the biggest marina in the Algarve, and fishing here, while still fun, is a slightly more serious business. Again, reef fishing is on offer – or you could take your choice from shark fishing, tuna and dorado fishing, or chasing the mighty marlin. That said, the choice of operator is seemingly limited to one – SeaBookings.com – but prices start from a very reasonable €40pp. Even the marlin fishing is only €120pp. Or you could head for Alvor, 23kms west, in the other direction from Rocha Brava, along the EM1273, the N125 and the EM531-1. Alvor started life as a small fishing town, precisely due to the abundance of fish in its waters. Once again SeaBookings.com is the major player here, but there are loads of trips you can choose, depending on your preferences, time and budget. The shortest trips are designed for the whole family to have fun together. The most common trip lasts two hours, visits an area about 2½kms off the coast, and you should be able to catch sea bass, squid and cuttlefish – and then take it home with you to cook. The cost? Just €25pp. But once again there’s also reef and shark fishing on offer – or, for a cool €1,000, you can charter a boat for up to six people to go after big game. But if you don’t fancy a boat trip, there’s nothing to stop you sea-fishing from dry land. 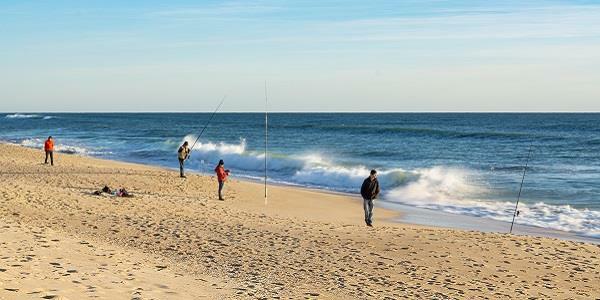 If you prefer to fish from the beach, try the following: Praia de Alvor (driving instructions above), Praia de Armação de Pêra (12kms east along the EM1154 and EM530-1) and Praia dos Salgados (17kms west on the EM1154 and EM530-1). Fishing from beaches is best when the sea is rough (during the winter for example), and you should be able to catch larger fish such as dorado and sea bass. 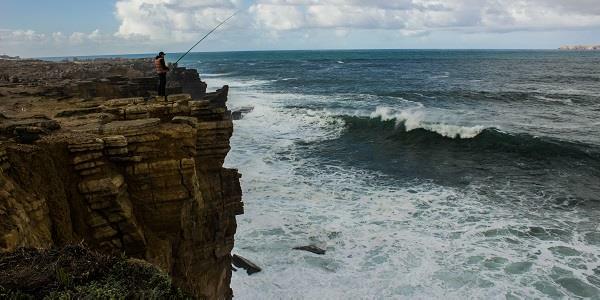 Or – for the brave/non-acrophobic – there’s always fishing from the clifftops. The Algarve boasts some beautiful cliffs with breathtaking land and seascapes, perfect for a ‘relaxing’ afternoon fishing, while watching the sun go down. The best spots for cliff-fishing would be the Praia da Falésia cliffs at Vilamoura (see driving instructions above), the cliffs at Portimão (15kms north-west along the EM1273 and via Ferragudo) and Carvoeiro (the Algar Sêco formation, featured here). These cliffs are ideal for when the sea is calmer, especially during summer or spring, and normally you can catch small fish like bream. Beach fishing is frowned upon during the high holiday season (June to September), and a fishing licence is mandatory (all year round); obtaining one is not totally plain-sailing, however. Your best bet is to get one in advance of your holiday. To start the ball rolling, email pesca.ludica@dgrm.mam.gov.pt, and they will send you instructions as to how to proceed. At the time of writing, a licence valid for one year costs €8.